Are you looking for ways to get more flax into your diet? These crackers are loaded with flax, tasty and a great alternative to traditional crackers. These are "cooked" in the dehydrator at a low temp to keep the enzymes intact. They are crispy, gluten free and guilt free. Flaxseeds contain anti-inflammatory omega-3 fatty acids (although not the same type that fish, such as salmon, do) along with antioxidant substances called lignans that help promote hormonal balance in addition to several other benefits of flaxseed. Benefits of flaxseed include helping improve digestion, skin, cardiovascular health, cholesterol and hormone balance while fighting cancer and even sugar cravings. Soak the seeds for a couple of hours- the seeds will soak up all the water and become gelatinous. This gelatinous factor is what will hold the seeds together. Stir to mix in all of the seasonings. Spread on dehydrator sheets lined with a teflex sheet. Spread evenly across with an offset spatula about 1/8 inch thick. Using the spatula score into squares, triangles so that once they are completely dried- you can break them into squares easily. Set your dehydrator's temp to 115. Once the top is completely crisp you can flip over and peel the teflex sheet off. Continue dehydrating until they are completely dry. It is usually about 5 hours until you can flip them over. Then I leave them in for another 12 hours. I use an Excalibur dehydrator. It has a thermostat so you can adjust it the temp you want. It has square sheets that you can remove to make room for thicker items. You will need teflex sheets to line the dehydrator's sheets. This will make about 3 trays worth of crackers. 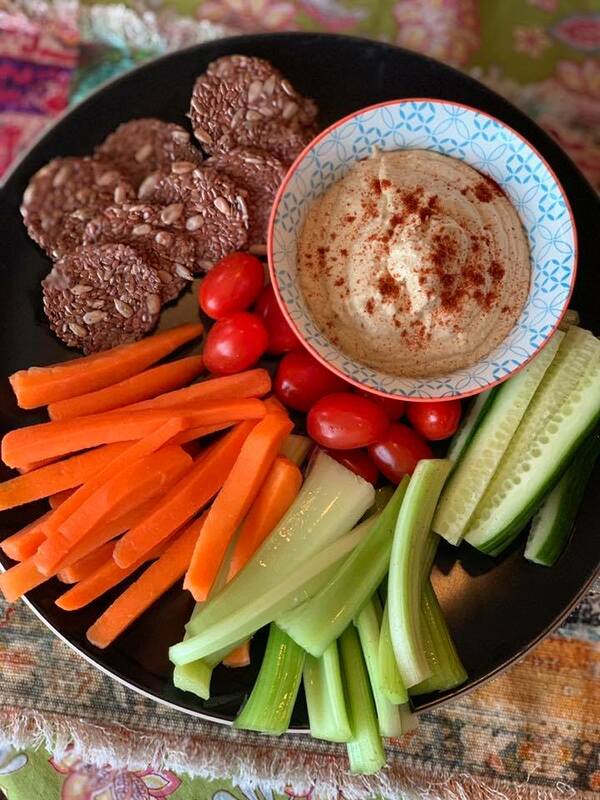 My favorite way to eat my flax crackers is with my raw hummus. To learn more about the raw food/plant based diet and Debra's services please visit her website. She offers a 6 week raw vegan/plant based coaching program.